4 Smoothies To Pair With Your Topical Beauty Infusion™ Superfood Oils. Healthy skin starts on the inside. Just like your body needs to be filled with nutrients, your skin also needs to be fed with healthy vitamins and minerals. Smoothies are an excellent way to pack nutrients into one meal and the perfect way to start off your day. Combine nourishing your body on the inside and nourishing your skin on the outside with these four topical Beauty Infusion™ Superfoods. Your skin will radiate from the inside out! This smoothie is filled with ingredients that will benefit your skin. 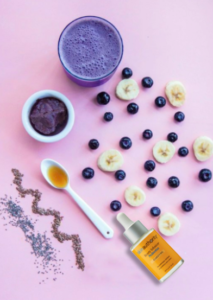 Antioxidants in blueberries combined with the curcumin found in turmeric create a power duo to help even out skin tone and reduce inflammation. The apple cider vinegar will balance your pH levels of the mantle layer of your skin, leaving your complexion glowing, while the ginger and coconut oil will improve your skin tone. 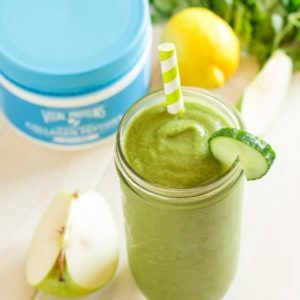 Starting your morning off with this nutrient-packed smoothie will make your body and complexion ready to take on the day. To enhance the benefits, mix some topical Beauty Infusion™ Turmeric & Blueberry for Hydrating oil with your foundation and make your skin glow. 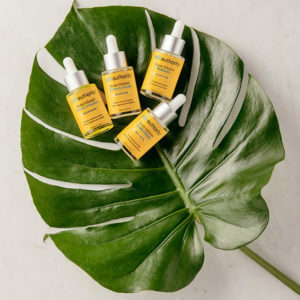 Our topical Beauty Infusion™ Swertia Chirata for Anti-Aging oil contains the Himalayan gentian herb extract to help reduce the appearance of wrinkles and photo aged skin. Combine a smoothie that contains anti-aging ingredients like collagen protein and chia seeds with the antioxidant tocopherols — the ultimate concoction for defying gravity. Add pineapple for sweetness and you’re ready to take on the day! Kefir contains probiotics with friendly bacteria to promote skin clarity and pH balance. The chlorophyll in spinach helps fight breakouts and heals wounded skin. Combine this smoothie with our topical Beauty Infusion™ Probiotics for Clarifying oil to help soothe and heal your skin. 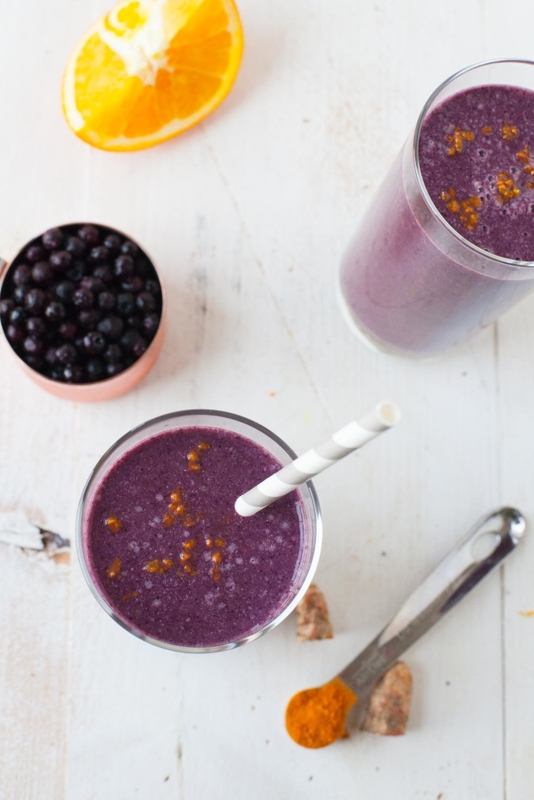 Make this delicious and hydrating smoothie before work to fill you up. Avocados are a great source of antioxidant carotenoids like alpha-carotene and beta carotene. These quenching antioxidants provide protection from the environmental damage that leads to fine lines and wrinkles. 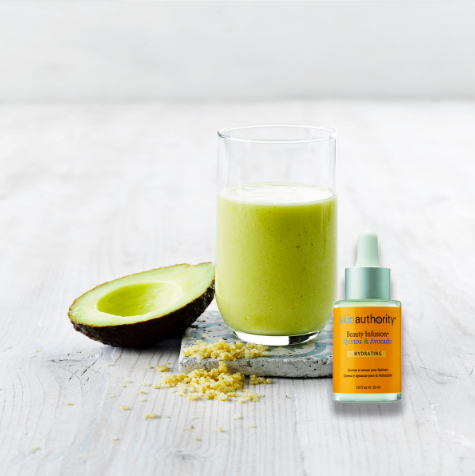 Pair our topical Beauty Infusion™ Quinoa and Avocado for Hydrating oil with this smoothie by mixing it in with your moisturizer. The protein in the quinoa paired with the antioxidants in avocado oil will improve the texture of your skin. Click here to learn about the Skin Authority topical Beauty Infusion™ Collection.